FAQs - L.A. Gold Leaf Wholesaler U.S.
What is our shipping and returns policy? What are the common uses of our metal leaf products? 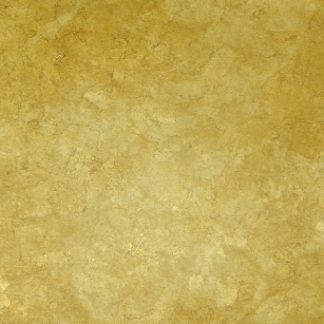 What are the basic steps in Gold Leafing? How to Gold Leaf on glass surface? 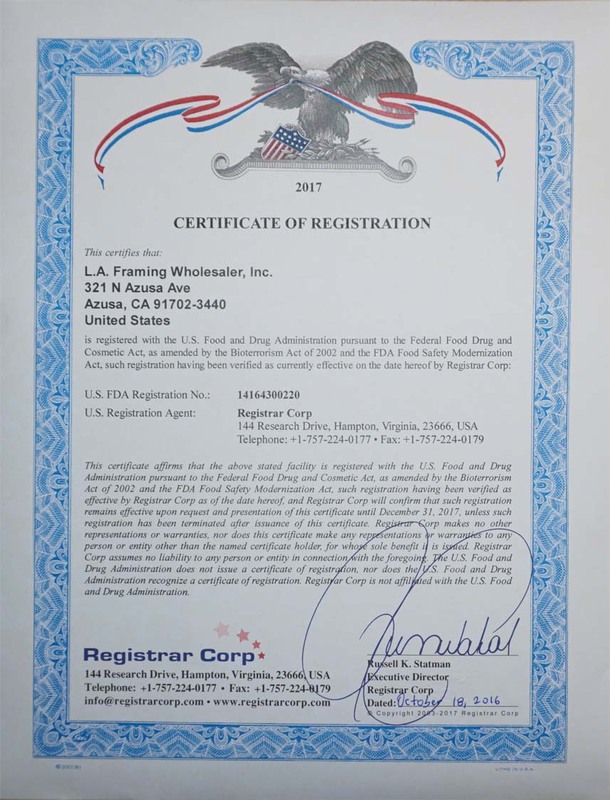 Are we registered with the U.S. Food and Drug Administration (FDA) ? or 10:00am – 2:00pm saturdays. Step 1: Prepare work area: Cover working surfaces and floor areas with drop cloths or newspaper. Use low-tack painters tape to mask any areas not to be gilded. Lightly sand the surface if necessary with 220 grit sandpaper to remove any blemishes.Step 2: Prime surface: remove sanding dust with a tack cloth and apply a quality primer. This primer-sealer has been specially formulated for gilding processes and is available in 3 color tones – Red, Grey and Ochre. Step 3: Apply adhesive ‘size’. Size refers to the adhesive used to adhere the leaf to a surface. There are different kinds of size adhesive dependant on the finished look you desire. 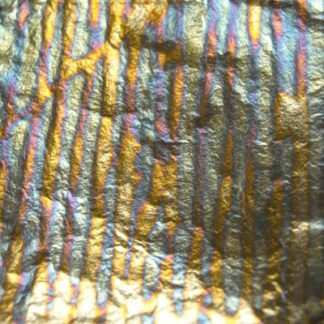 For most common gilding practices there is a choice of sizing available, water-based or oil-based. Apply carefully and evenly, working the size to an even film as much as possible. just before it dries completely. Step 5: Applying Gold Leaf placing a book of leaf in your hand, carefully fold back the protective paper to expose the gold leaf. Lay the leaf onto the sized area and ‘roll’ out the leaf. Hold firmly and carefully. Attach leaf to surface. 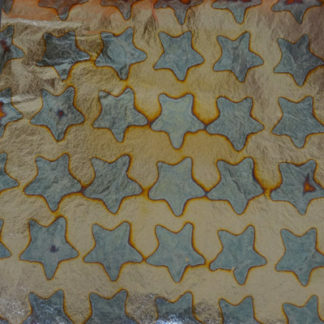 Carefully remove a single sheet of gold leaf paper and gently apply to your surface. Rub over the back of the paper with a brush, or gently with your fingers. Carefully remove the paper to leave the gold leaf adhered to the surface. Step 6: ‘Burnishing’ the leaf -After the leaf is laid on, rub gently and thoroughly with a soft brush to insure complete adhesion. Step 7: Touching up the leaf surface. Touch up any areas that are missing leaf due to lack of sufficient sizing or from leafed areas that may have torn away during burnishing. Step 8: Seal and protect the gilded surface. Genuine Gold Leaf with a karat rating of 22kt or higher (22kt, 23kt, 23.5kt, 23.75kt, 24kt) does not require sealing. However, it is often desirable to apply a protective coat of sealer to insure durability of the leaf, particularly in high traffic areas or for heavy use objects and furniture. Acrylic Topcoat is a non-reactive, premium water clear sealer for genuine and metal leaf. Made from acrylic copolymers, Acrylic Topcoat provides protection from abrasion, water and ultra violet light. This solvent based sealer resists chemicals and may be applied by brush or spray. Available in Gloss and Satin finishes. Step 1: First, insure the glass surface is completely clean. Generally Denatured Alcohol works best as a cleaning agent. Be sure to use a lint free cloth.Step 2: Apply Gelatin sizing (adhesive) to the glass surface where you would like the gold to adhere. Step 3: Apply 22kt Genuine Gold leaf – loose leaf (note: transfer Leaf will not work for gilding on glass). You can use 22kt or higher, depending on final look and color tone desired. Step 4: Allow Gelatin Sizing to dry fully then remove any excess leaf bits with a soft Squirrel Mop brush. Step 5: Back-up the gold with paint or clear varnish. Often Gold Lettering and graphics are painted over to protect and seal the gold as well as increase the reflectivity and luster of the gold, as seen through the front of the glass or mirror. This color can affect the Gold tone slightly. Using a Terracotta Red will warm the Gold, while using a Black can make it appear bolder and colder. Yellow tends to mellow the Gold and add depth. Alternatively, you can skip the paint layer and back-up the letter forms or graphics directly with clear varnish, see step 6. If you choose to use paint, be sure to add a final layer of clear varnish over the painted surface. Step 6: Complete the process with a clear coat of Varnish (even if you applied a paint layer, as in step 5). The working surface should be as smooth as possible. 2 coats of high quality primer should be applied, followed by 2 coats finished paint.The base color for the finished paint layer varies depending on your project requirements. 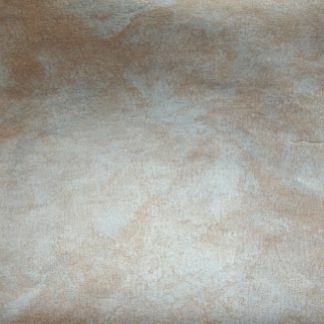 A Latex Eggshell finish will provide superior results. Using a water based size, allows for easy application and clean-up and extended ‘tack’ time, allowing you to apply your leaf in a less hurried manner. Apply the adhesive size with a short nap roller. 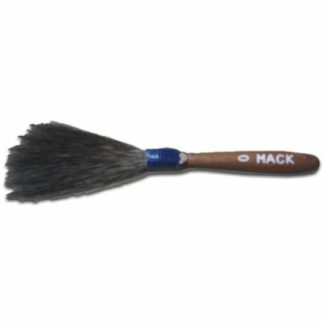 While it is still wet, use a high quality brush and soften and smooth the size evenly over the surface. With water-based size, allow to come to ‘tack’ in approximately 1/2 hour. ‘Tack’ time for oil based sizing varies depending on the type of size used and environmental conditions, such as temperature and humidity. brush and rub over the paper backing to insure all the leaf is attached to the surface. You can gently rub the paper backing with your fingers also – if you are careful and do not allow the paper backing to move or scratch the leaf surface. Gently remove the paper from the leaf, using a gilder’s brush. Make sure there are no air bubbles and the leaf is firmly attached to the working surface. Peel the paper backing off slowly and carefully. ‘Burnish’ the surface to remove any excess leaf, known as skewings. 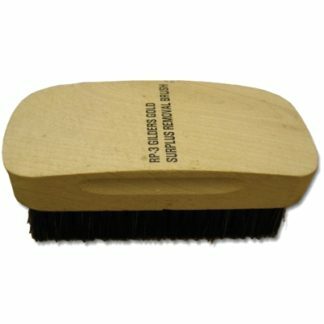 Use your soft gilder’s brush so you do not scratch and dull the leaf surface. Touch up (missed spots) with scrap pieces of your leaf on paper. Followed by a light brushing again to remove any excess and loose leaf bits. Apply water-based varnish, using a short nap roller. While this is still wet, soften the varnish using a high quality brush. 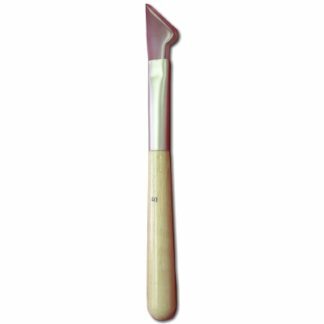 Brush in a criss-cross pattern to smooth surface evenly. recommend a product specially formulated for exterior gilding on metal manufactured. 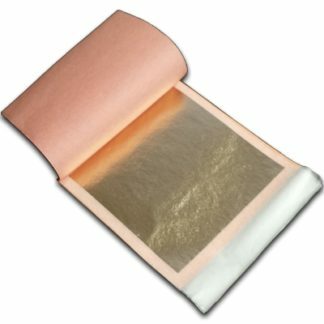 The Burnish Sealer is a primer-sealer specially designed for use under gilding size (adhesive). It is available in 3 colors, Red, Gray and Ochre. for easier handling). 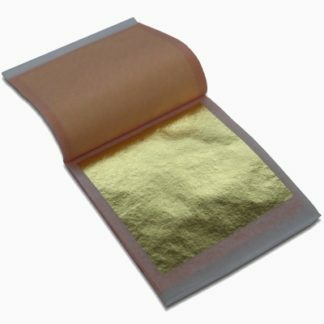 For exterior gilding using Patent (transfer) Gold Leaf is infinitely more efficient, as you can handle and manipulate the leaf with ease due to the gold being attached to the paper surface. Acrylic Topcoat is a non-reactive, premium water clear sealer for genuine and metal leaf. Made from acrylic copolymers, Acrylic Topcoat provides protection from abrasion, water and ultra violet light.